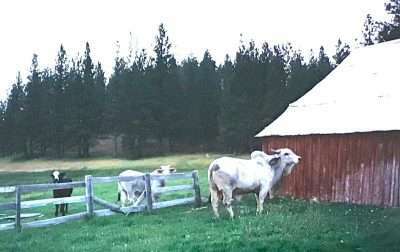 Brahman cattle from the Carmichaels’ adjoining property often wandered over to visit the ranch. It was at Summerfest 2018 on July 7 that two old friends closely related to White Sulphur Springs Ranch turned up to say “Hello” and check the status of the historic ranch site. Sheryl and Mike Cornelisen, innkeepers of the property from 1993 to 1995, described happy days at the ranch to members of the Mohawk Valley Stewardship Council (MVSC) at their annual fundraiser. 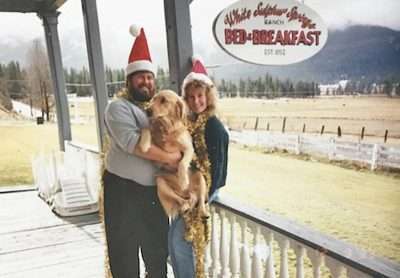 The ranch was an active B&B at the time, and the couple was employed by owners Linda and Tom Vanella of Chico, and Don and Karen Miller of Quincy. Sheryl and Mike were previously employed in the restaurant industry and were drawn to the beauty of the Mohawk Valley and the historical significance of the ranch. Twenty-five years ago, the site had many more structures on it than are seen today. In addition to the main ranch house, there was also a two-story bunkhouse and two guest cottages known as the Dairy House and the Hen House. 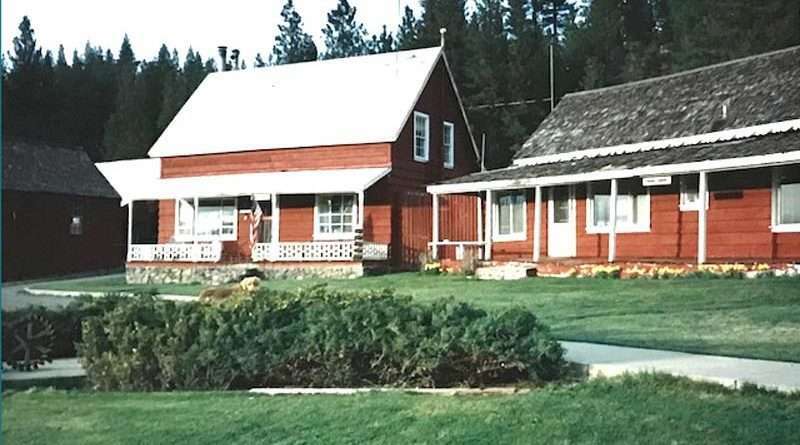 There were six separate rooms available for rent in the main ranch house. The bunkhouse was home for the innkeepers. The ranch came into existence in 1852, when Asa Gould, Mr. Jamison and Mr. Friend purchased 400 acres at the head of the Mohawk Valley. They called it the Sulphur Springs Ranch, named for the numerous warm and cold springs on the property. It was sold to Fred King, another pioneer of the area, and his partners and became a hotel in 1858. The hotel was a popular stagecoach stop for travelers between Quincy and Truckee. A tri-fold brochure describing the accommodations and rates in 1993 advised the customer to “capture the past while enjoying the leisurely activities of the present.” The same brochure offered the “Fern Room” in the main house for $100 per night, including a queen bed, a private bath and a full breakfast. During the time the Cornelisens worked there, the spring-fed pool, in particular, was an important part of the Ranch complex. It would be rented to private groups for picnics and weddings for about $150 a day, otherwise the pool was only available to guests of the B&B. Some of the guests hailed from Germany, England and Canada. The most prominent guest was Mare Winningham. She attended one of the pool parties, but did not stay the night. She is an actress-musician-songwriter whose was one of the original brat pack in the movie “St. Elmo’s Fire” in 1976. She owned property in the area at the time and raised her family there as an escape from the Hollywood rat race. The Cornelisens did a weekly radio show with a Reno disc jockey by the name of Ricky Randall. He and his wife also stayed at the ranch overnight. Sheryl and Mike Cornelisen put out a Christmas card that featured the B&B in 1993. The ranch was open year-round in the ‘90s with the majority of the guests coming from the Bay Area. Winter lent a certain charm and beauty to the site. White Sulphur Springs Ranch has been an important part of the Mohawk Valley landscape from 1852 until its sale in 2003. The new owner took several of the buildings down, and the steep decline of the Ranch began at that time. MVSC acquired the property in 2010. The MVSC, with its dedicated volunteers, are committed to restoring the property and renewing its contribution to the community. A professional grant writer has been retained to help raise the funds necessary to carry on the work. To become a part of this process, visit WhiteSulphurSpringsRanch.com or call 836-2334. Thank you for these pictures and memories! My mom, Lonnie Jeffries, was the innkeeper before the Cornelisen’s and my older children grew up with great memories of summers helping at the Big House! Although my mother passed away in 2005, she still lived in the area and visited the property quite often. She truly loved her time there, and because of that White Sulpher Springs Ranch has a very special place in the heart of our family and always will!